Cats communicate not only in purrs and growls but in many complex motions, using ears, eyes, tails, and body to express themselves. These expressions are often misunderstood. Here’s a guide to help you better understanding your cat. Straight up and quivering: Excited. If your tom cat has not been neutered this gesture can also mean he is ready to spray. Flat against head: Defensive, angry, stressed. It’s good to give the cat the opportunity to hide or get up high. Dilated pupils: Surprised, scared, stimulated, nervous. If they are fully dilated, the cat may be defensively aggressive. Pupils may also dilate when a cat is playful. Constricted pupils: Tense, aggressive. Pupils may also constrict, however, if a cat is content. Note the pupils may also change size simply according to the light. 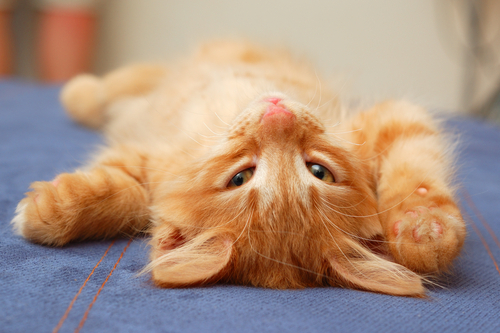 Belly up: Exposing its belly is a cat’s sign of trust, but it’s better to rub the head than the belly, according to Cats Protection. Rubbing the belly can be like a violation of the trust the cat is expressing. Cats will often nip at or push a human’s arm away when its belly is rubbed. Rubbing: Cats are marking objects, or their owners, with their scent.